"I'm not going to be what I've turned into anymore…" IFC Films has debuted an impressive official trailer for Tim Blake Nelson's drama Anesthesia, set in New York City telling an ensemble story of how a tragedy connects a number of people involved around the city. Kristen Stewart stars, with Sam Waterston as the professor who is attacked; plus Glenn Close, Gretchen Mol, Tim Blake Nelson, Corey Stoll and Michael K. Williams in supporting roles. This is a very lovely trailer that makes this film look uplifting and inspiring, in many little ways following some interesting stories. It seems like there is sadness but also so many good lessons to learn from everything that is being said. Worth taking a look at this ensemble film. A snowy New York City night, a beloved teacher, a shocking crime: this provocative drama pieces together the puzzle of a mans life just before it changes forever. While on his way home one evening, Walter Zarrow (Sam Waterston), a popular Columbia University philosophy professor, is violently attacked on the street. Flash back one week, as actor-director Tim Blake Nelson traces the domino effect of events that led up to this seemingly senseless assault. Along the way, hidden connections between a seemingly disparate group of people including a self-destructive student, a hard-drinking suburban housewife, and a desperate junkie emerge, forming a complex, engrossing mosaic of lost souls united by tragedy. 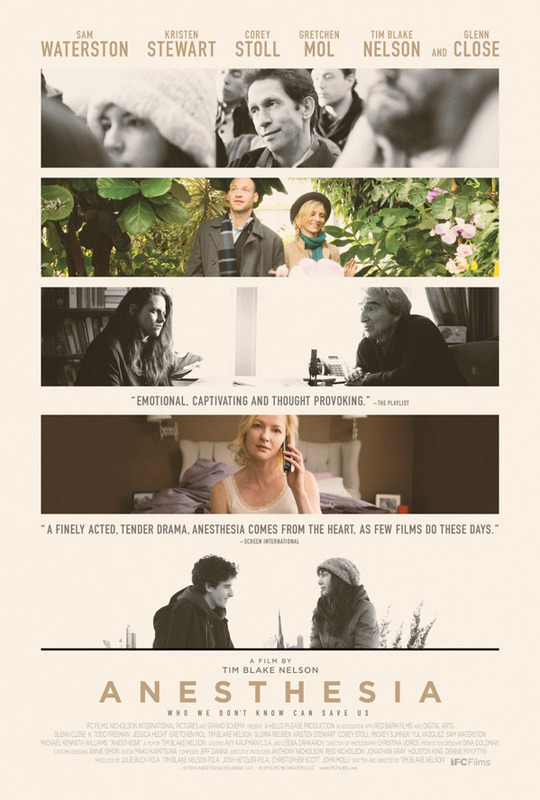 Anesthesia is both written & directed by actor-filmmaker Tim Blake Nelson, who last directed Leaves of Grass as well as The Grey Zone. The film arrives in select theaters + on VOD starting January 8th, 2016 early next month. Anyone? Stewart playing another emo young woman? // Everyone else looks good though. Can't say I saw anything wrong with her performance in this trailer, she looks just as good as the others. This is a fine cast full of headliners, and Jessica Hecht is one of my all time favorite actors.